Today we announced our newest release of InfiniBox™ system software – “Infinibox R4”. This release introduces new enterprise features designed to enhance the core functionality (performance, availability, scalability, ease-of-use, cost-effectiveness) while significantly resetting the bar for capabilities such as replication and quality of service (QoS). When we implement a new feature, we don’t begin by thinking about “how to check the box.” We set out to exceed the meaning of “best in class” and set the bar higher across the industry. How do we decide what to do in a release like this? We start with our customers. In this case, we talked to over 100 companies globally to understand what’s critical for them to accelerate their innovation and discovery. Our customers represent a broad spectrum of industries and use cases, and their IT operations support a huge diversity of workloads. The trick for us is to listen carefully to their requirements, but also to figure out what they really need and what will make a difference for their business. This approach is deeply ingrained in our engineering culture. We did just that for this release. At the top of our list is Synchronous Replication. 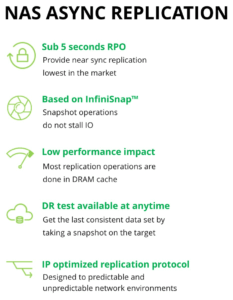 Especially important for our European customers, this feature builds on our industry-leading, ultra-low RPO asynchronous replication capability. It employs the same ease-of-use to setup and manage, enabling replication in three easy steps. Customers no longer have to sacrifice latency for data integrity. With our implementation there are no tradeoffs – we have reduced write latency on the target system by an incredible 35%, and it provides <400µs host side latency. Customers with demanding governance models or stringent legal requirements now have the best synchronous replication to protect their hyperscale data. Next is the implementation of Quality of Service (QoS). This is probably the most popular topic with our Service Provider customers, as well as our Enterprise IT customers. In a nutshell, storage administrators can leverage a software-defined service to create policies that govern the allocation of IOPS and/or throughput by volume or pool. Gone are the days of pinning workloads to tiers of storage, or worse, manually migrating them between different physical systems. It is a more flexible, pragmatic, and cost-effective approach than most of the traditional methods of defining and allocating performance. We took this approach because no control (“I promise not to use 3x my allocated capacity”) and strict control (“I hit the IOP wall and my application just crashed!”) don’t work. It’s incredible what our engineers have done. I’ll leave the technical explanation of how this works for another post from the product team. Suffice to say QoS not only tackles the “noisy neighbor” problem, as it should, but more importantly, it enables tiered storage performance at petabyte scale in a powerful new way. 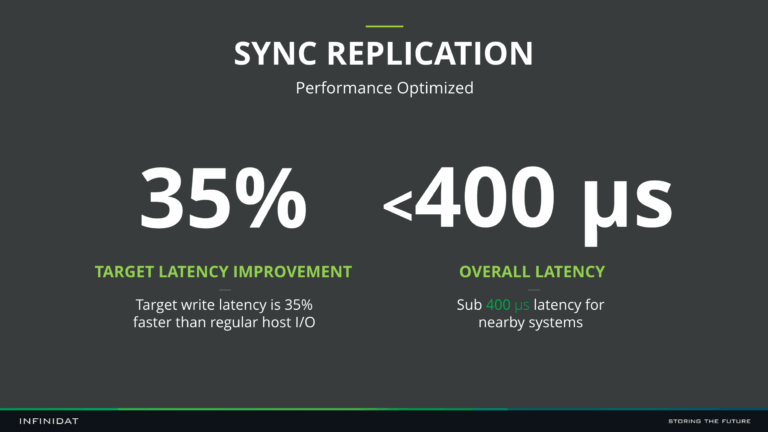 With 4.0 we’re also introducing the addition of Asynchronous Replication for NAS. IP-based, with sub-5 second RPO, optimized data transfer, and low impact on performance, it is a welcome addition to our unified storage system. In addition to these major new features and enhancements, we continue to enhance our GUI, InfiniMetrics, and Host PowerTools™ to reflect these added features. Finally, but certainly not least, is NAS Directory Quotas (TreeQ). This will allow for easy allocation of capacity by user/department, reducing filer sprawl and enabling more balanced consumption. In addition to simplifying allocation and maximizing capacity, this will help customers with migration from legacy NAS systems that already have quotas implemented. This, like all the other new features, is done with very little to no impact on performance, a testament to the engineering and testing rigor we continue to put into our solutions. And there are actually a bunch of other additional “goodies” in this release. A lot of work went into this update, and our customers are thrilled to get their hands on it and put it through its paces. We think they’ll love what they see. The best part is, this is really just the beginning. To learn more about INFINIDAT and the new InfiniBox software read the press release or contact us to see a demonstration.